DEVELOP3D is a monthly print and digital design journal read by tens of thousands of product designers, covering essential technologies used throughout the entire product development process, including, CAD, CAM and digital fabrication. 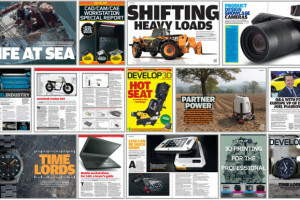 Our free content is available through the website (link www.develop3d.com), via downloadable PDF and for those in the UK there is a printed magazine. Subscription to the iPad/ Tablet version is available for a nominal fee from the Apple iTunes store (link – https://itunes.apple.com/us/app/develop3d/id477754031?mt=8) and works on iPad’s and iPhones.